Allow for 15-20 seconds for the server to boots and take note of its IP address. With that, go to DreamHost control panel to create a new domain for that IP. If your domain is not registered on DreamHost, follow the instructions by your provider to assign a domain or subdomain to an IP. 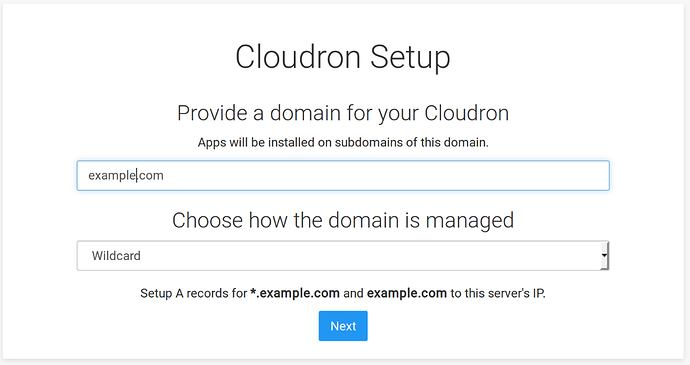 I you choose to use a subdomain you need to buy an enterprise edition of Cloudron. You need two A records: one for *.example.com and one for example.com, using the same IP address for both. While the DNS records get updated, connect to the newly created machine. Join us at https://chat.cloudron.io for any questions. Visit https://<IP> to finish setup once the server has rebooted. Rebooting this server now to let bootloader changes take effect. After the system reboots, point your browser to the IP address of the virtual machine or, if the DNS records have propagated already, use the new domain name. 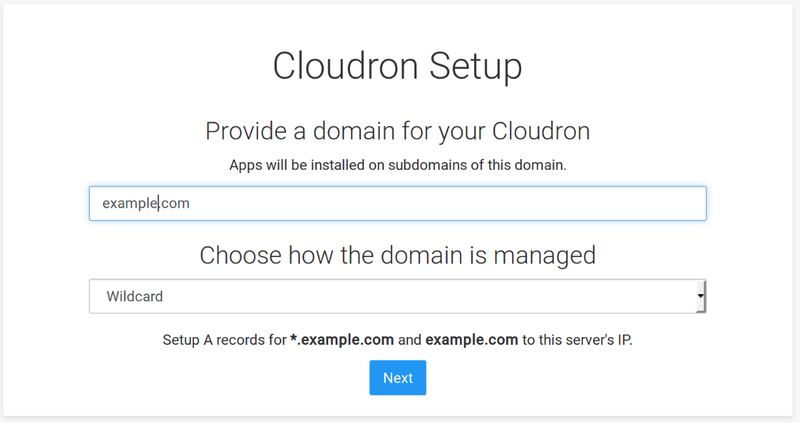 Cloudron uses a self-signed certificate for SSL which will send your browser in a panic: accept the certificate and continue the setup as directed by Cloudron docs. 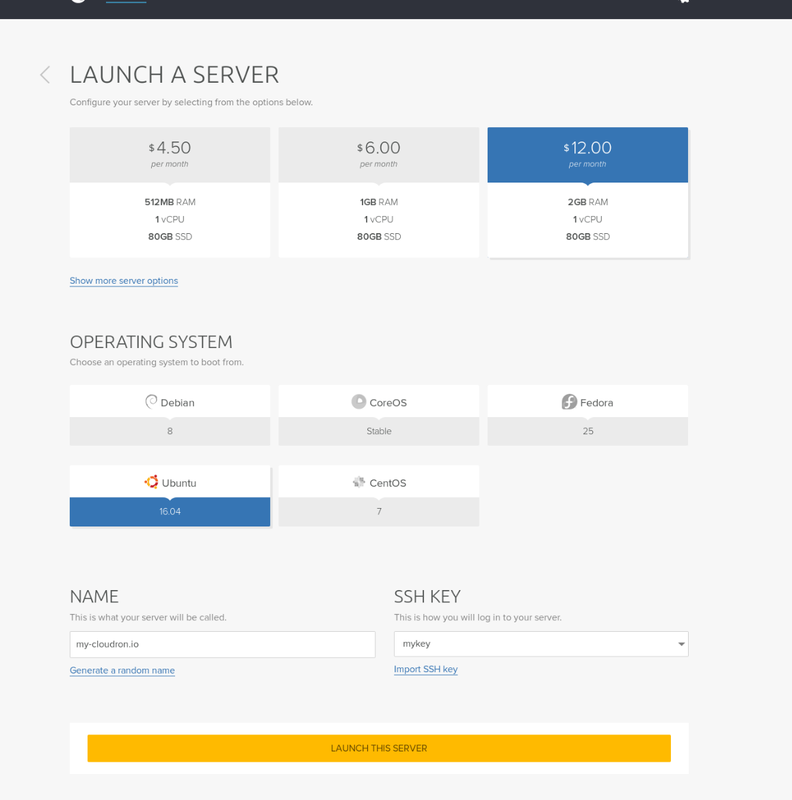 Choose Wildcard as the option to manage the domain. Hit next and Cloudron will do its things, including setup a proper SSL certificate with Let’s Encrypt. After that’s done, it’s time to register your new admin account and start installing apps.